New Cross Gate takes its name from a tollgate erected in 1718 at the top of what is now Clifton Rise (at the far right of the map below). The tollgate was relocated in 1813 to the junction of New Cross Road and Peckham Lane (now Queens Road, off the left side of the map). This part of New Cross Road was built up from the 1820s with good-quality terraced housing. The station opened in 1839, originally as New Cross, and a prolonged period of building began soon after­wards. 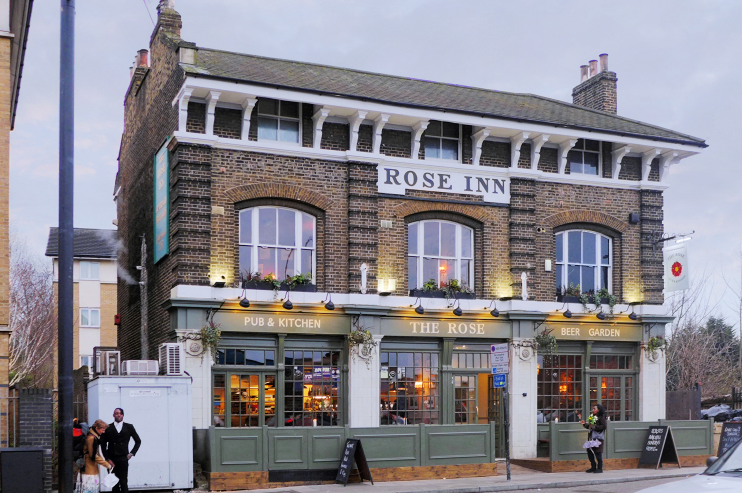 Shown in the photo­graph above,* the Rose Inn opened opposite the station in 1855. Many early properties have since either been replaced or converted to new uses. Terraced houses on New Cross Road have had shops built over their front gardens, while houses elsewhere have been subdivided into flats. A Sainsbury’s super­market occupies the site of former locomotive sheds and workshops. The tram depot that was built in 1906 was replaced by a bus garage in the 1950s. The Electric Empire cinema that opened in 1909 is now a solicitor’s. Charles Dickens kept a secret apartment at New Cross Gate, a semi-rural retreat where he wrote Bleak House and later completed Great Expectations. The lodgings also provided him with convenient access to his mistress in Nunhead. The picture of The Rose Inn on this page is adapted from an original photograph, copyright Ewan Munro, at Flickr, made available under the Attribution-ShareAlike 2.0 Generic Licence. Any subsequent reuse is freely permitted under the terms of that licence.